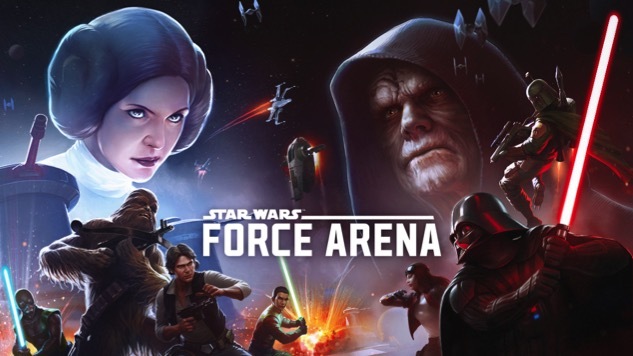 Lucasfilm and partner Netmarble Games have a surprise for smartphone-wielding fans of that galaxy far, far away: the companies’ most recently announced mobile title, Star Wars: Force Arena, is out today on iOS and Android. The MOBA-esque, card-based, free-to-play game went live at 12 p.m. EST today. The game centers around players assembling teams of well-known Star Wars characters such as Han Solo and Darth Vader, as well as newcomers like Rogue One’s Jyn Erso and Cassian Andor, and pitting them against one another in 1v1 or 2v2 multiplayer arena matches. Players collect cards that represent characters and abilities, and are rewarded after battles with more card packs and crystals (in-game currency). To celebrate the global launch of the game, Netmarble will host a global check-in event from launch on Jan. 12 until Jan. 20, 2017. Players checking-in daily during the event will receive crystals (in-game currency), leader cards, and gold card packs to strengthen their decks. Premium booster packs, which shorten the time limit on opening reward card packs, will also be given out during this exciting launch event. Returning users can expect regular live updates with new content, characters and units. Korean developer Netmarble is best known for their other mobile titles like MARVEL Future Fight, Seven Knights and Everybody’s Marble. For more about their newest Star Wars game, check out the official site. iOS users can download the game here and Android users can get it here.